These social, funny, adorable rodents are great companions for children learning to take care of a pet. But providing your gerbil with the proper nutrition is essential to helping them lead a long, healthy, and happy life. Seed Mixes - These are loose mixtures of seeds, sometimes with pellets or dried vegetables and fruits added. Most of these will be nutritionally balanced but only if your gerbil eats everything in the mix. Unfortunately though, many gerbils will pick out their favorite items and leave the rest of the mixture in their bowl which can lead to a dietary imbalance if there are components your gerbils consistently avoid. This may be especially true if there are large amounts of sunflower seeds in the mixture (which are often favored by gerbils but are quite fatty) and alone are not a balanced diet. Because loose seed mixtures don't ensure a complete and balanced diet without eating all of the contents, they are not ideal for use as your gerbil's sole food. Pellets and Lab Blocks - These gerbil diets have the advantage of being nutritionally balanced. Pellets are the smaller pieces and lab blocks are the larger chunks of food that resemble small biscuits. Both are good options, although some people believe the lab blocks are the most ideal because of some thorough scientific research behind them. Unlike loose mixtures, the gerbils can't pick and choose which components of the diet they want to eat so the blocks and pellets ensure a balanced diet in every bite. However, this type of food offers little variety and enrichment. Therefore, while pellets and lab blocks make a good basic diet, some supplementation with other foods is still recommended for mental health. What Gerbil Food is Best? Feeding pet gerbils a combination of foods helps to overcome the disadvantages of the different kinds of diets. A pelleted or lab block diet can form the balanced base of your gerbil's diet while a loose seed mix and other treats add interest and variety. Make sure your gerbil eats enough of the pellets or lab blocks to get those nutritional benefits before giving them the seed mixture or other treats. Avoiding seed mixtures that contain sunflower seeds altogether and instead reserving those as special treats can be very helpful in taming and training your pet gerbil. Many gerbils love fruits and vegetables. Start out by offering small amounts of fresh vegetables or fruits to prevent diarrhea from eating too much at once. Make sure all vegetables and fruits are well washed and pesticide free as well. You can try items such as carrots, broccoli, dandelion greens, apples, and berries. Avoid raw kidney beans, raw potato, onion, potato leaves, and rhubarb leaves. Nuts can be offered but do so sparingly since they are high in fat. Sunflower seeds and pumpkin seeds can be offered sparingly since they are high in fat. Whole grain bread can be offered either plain or toasted. Breakfast cereal that is unsweetened often becomes a favorite treat for gerbils. Small amounts of egg, either scrambled or boiled, can be offered. On occasion, try offering mealworms to your gerbil. Some gerbils enjoy chewing on small dog biscuits (without meat) to help keep their teeth filed (because just like a hamster, their teeth are continuously growing). Your best bet to feed your gerbil is to use a heavy crock made of ceramic that they cannot chew or tip over. Place the lab blocks or pelleted diet in the dish and add a bit of seed mixture (about a teaspoon) if desired. Once you have a feel for how much your gerbil eats, try to feed approximately the amount they will finish in a 24 hour period (but not too little), and remove any uneaten food before feeding them again in case it is damp or soiled. Establish a routine where your gerbils are fed at about the same time each day (the evening works well). Feed any treat items in a separate bowl and remove them after a couple of hours if uneaten to prevent spoilage. Alternatively, you can feed the treats by hand. 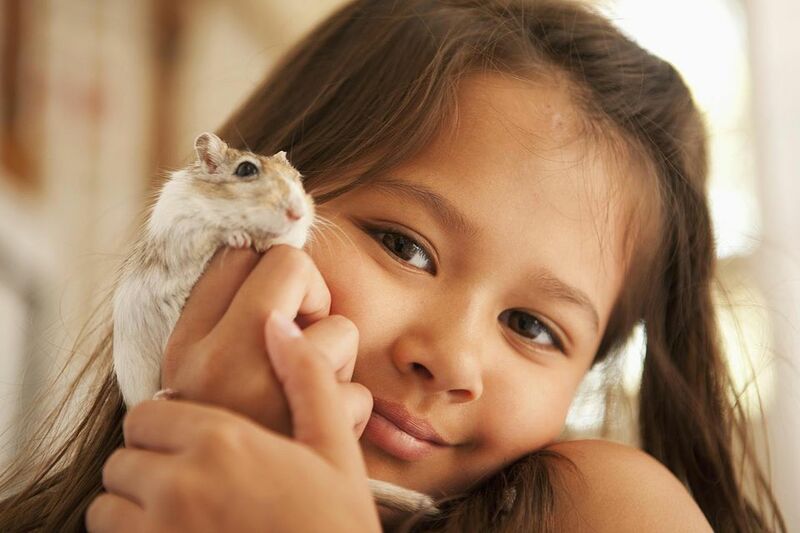 This is a great way to earn your gerbil's trust, tame them, and provide training and enrichment. Do Gerbils Need Fresh Water? Because gerbils come from Mongolia where there is a dry climate, they do not need a lot of water but despite this, don't make the mistake of thinking water is not important. Make sure your gerbil always has a supply of fresh, clean water in a sipper bottle.